I posted here about the current flow from Kilauea Volcano entering the sea, in a dramatic, firehose-like outpouring. In that post, I mentioned that the day after my visit, a cliff collapse caused the firehose to disappear from view. Things have settled down again and the firehose is once more visible, though another large crack not far back from the cliff is expected to cause another collapse soon. 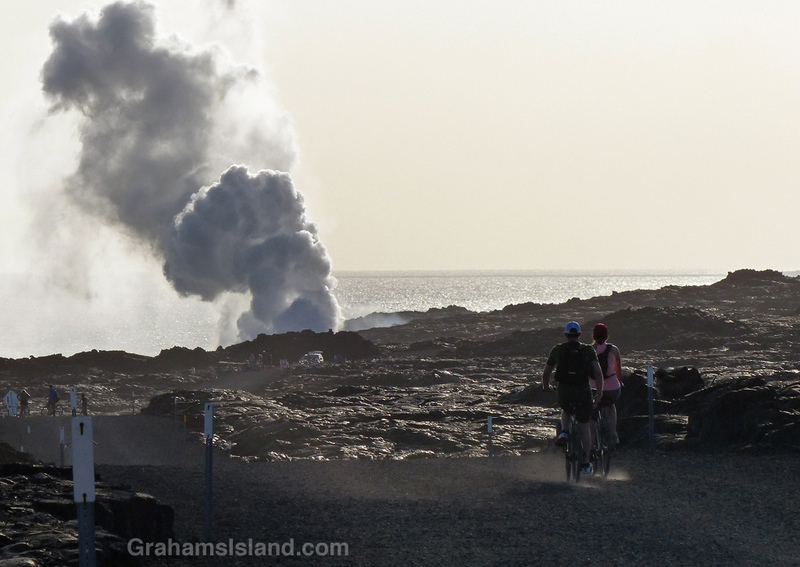 From the Kalapana side, it’s about four miles to the viewing area and a thriving trade in bike rentals has sprung up. When I was down that way last July there were a few bikes available for rent. Now there are maybe 200 or 300 available from a large number of vendors in the parking lot. At the viewing area, bikes were piled alongside the road, and locked in clumps. I preferred to walk, seeing the towering column of smoke and steam getting gradually larger on the way out, and enjoying a star-studded night sky on my return.